The EU’s GDPR places formidable pressures on organizations, even those already following existing privacy rules. 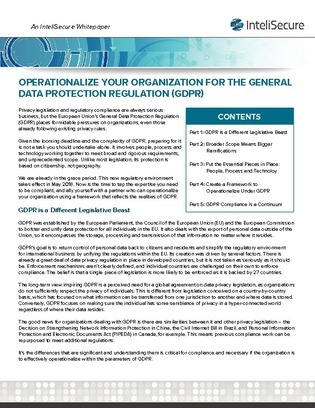 Creating a general data protection regulation framework to protect critical assets, both tangible and intangible (think IP), will enable you to operationalize your GDPR compliance. The transformation will make you nimble and well prepared to deal with any changes to GDPR, as well as any future regulatory changes and legislation you must adhere to. Ensure your organization takes the necessary steps to alleviate the pressure of preparing.